I had walked by at least two of their stores over a dozen times, but I had never actually stepped inside. On one cold, November night, I stepped inside with my boyfriend while waiting for a table at the sushi restaurant next door. I like tea, but didn’t expect to buy anything as I already have so many tea loves. Safe to say, I found a million new loves for tea. They have a ridiculous amount of varieties to choose from and they come out with a new flavor to add every month to their permanent collection! I went in to browse their Christmas themed products and finally settled on the Tea for the Tree holiday set. I was really excited for this little bundle. 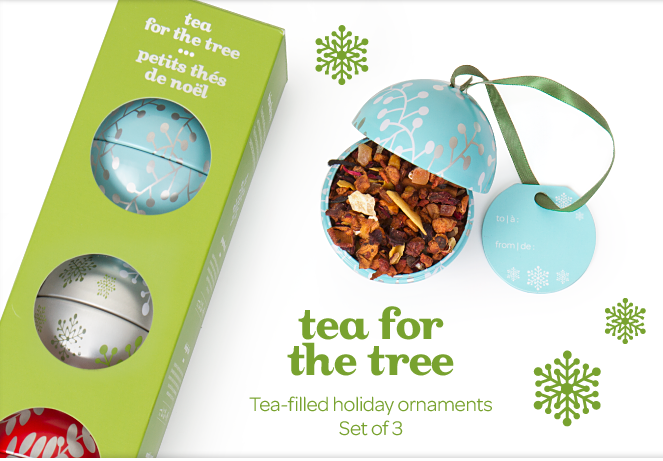 The set comes with three reusable ornament containers filled with three of their holiday tea favorites; Gingerbread, Sleigh Ride and Santa’s Secret. 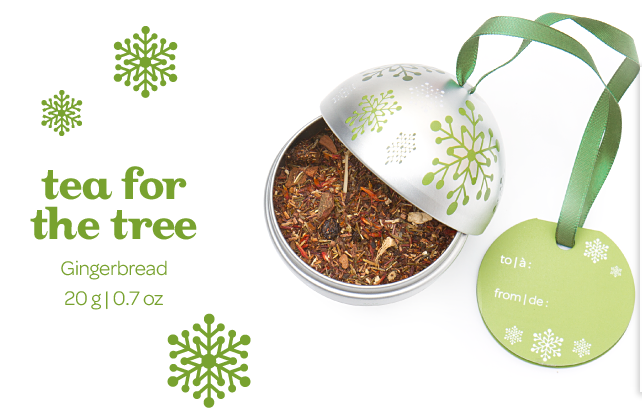 Gingerbread is a rooibos tea that tastes and smells like gingerbread cookies baking in the oven. 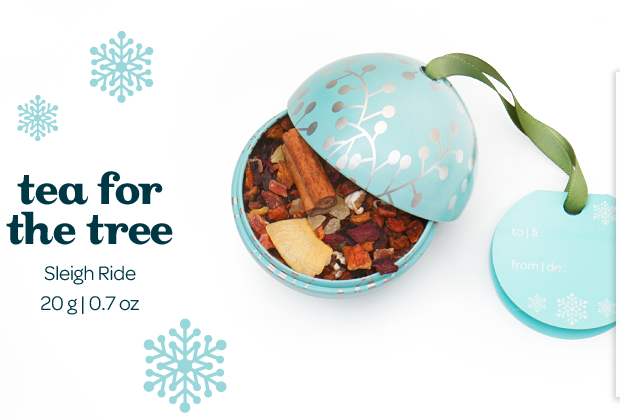 Sleigh Ride is a herbal tea that tastes like a cup of hot cider on a cold night. I can’t wait to drink this curled up under the covers with a christmas movie and some snug pajamas. ELF and a giant pot of Sleigh Ride, here I come! Last but definitely not least, Santa’s Secret. 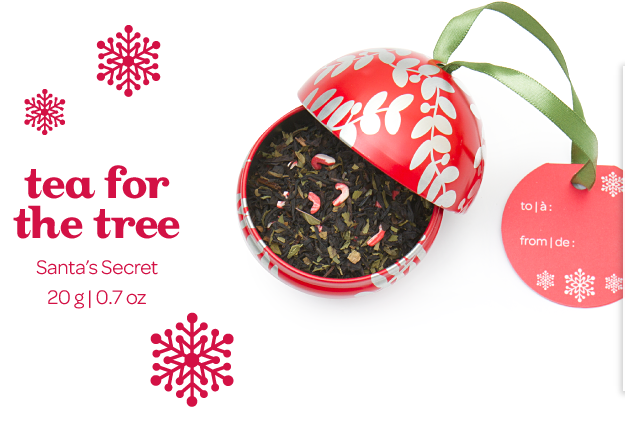 Santa’s Secret is a black, pepperminty tea. Even cooler than the flavor is the mini peppermint candy canes floating through the loose leaf tea that gives it that extra christmassy feel! A bonus to the Tea for Tree set is the reusable ornaments that come with it! I’ll have more ornaments for the tree that I can actually refill with little Christmas trinkets for friends and family. Safe to say that if you’re looking for a Christmas Gift for the tea lover in your life, check out the selection at David’s Tea! I left the link below. Happy Holiday Shopping!